This is meant to be Marcion. It could be bloody anybody, really. 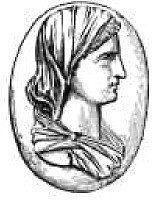 Marcion of Sinope or Markion (Greek: Μαρκίων Σινώπης) was an influential figure in the early Christian Church, and is retrospectively considered one of the first heresiarchs. Marcion was the son of the bishop of Sinope in Asia Minor, and apparently also a rather wealthy man himself. After getting into serious theological disagreements with the remainder of the Church, he was excommunicated by his own father, and was either not reconciled until his death or not reconciled period, depending on whose account is read. His exact dates are obscure, but he seems to have been active in the 140s CE, with the traditional date for the founding of the Marcionite sect calculated as 144. In an effort to reconcile the Old Testament of the Bible with the New, Marcion decided that the God of the Old Testament was a jealous demiurge, while the God of the New Testament was a universal, bigger, eternal, real God (aka ÜberGod™), in addition to being the father of Jesus. He also held that the demiurge's visit to the Garden of Eden was actually a real and physical sort of affair, whereas Jesus's incarnation was purely docetic. His particular version of the New Testament included parts of the Gospel of Luke and several of Paul's writings, but not any of the other books now considered canonical, although the fixing of the canon may have occurred partly in response to Marcionism. Marcion replaced the traditional gospels with his own version of the story of Jesus, which is known as the Gospel of Marcion or Gospel of the Lord. The dominant theory of its authorship is that Marcion rewrote the Gospel of Luke, making changes to better match his theology. The original text of this Gospel was lost but it has been reconstructed from the many fragments quoted in other writers, most of whom were arguing fiercely against Marcion's theology. An alternative scenario places Marcion's Gospel of the Lord as pre-dating the Gospel of Luke with Luke as well as Acts of the Apostles being written as counters to Marcionism. This scenario would replace Luke with Marcion in the two main solutions to the synoptic problem with Marcion either reusing only the bits of the Gospel of Mark and the Gospel of Matthew that could be fitted into the "non-Jewish" context of Marcionism, or with Marcion rejecting Matthew altogether (for being "too Jewish") in favour of a combination of Mark and the Q document. In either of these scenarios, the author of Luke-Acts would then have rewritten Marcion's gospel to fit with what became orthodox Christian theology. While it's essentially impossible to resolve these issues (because of the anonymity and uncertain composition date of Luke-Acts), the scenarios in which Marcion pre-dates Luke at least provide one possible explanation for why so much of Matthew was discarded: Unlike the anonymous author of Luke-Acts, whose motives can only be dimly deduced from his two works, we know that Marcion had strong theological reasons to discard anything that was too reminiscent of the Old Testament and Judaism. Marcion is also occasionally accused of having made forgeries which he presented as the (Pauline) Epistle to the Laodiceans and the Epistle to the Alexandrians. [notes 1] However, there is little evidence that his canon contained such texts, and of course no surviving means of judging their authenticity if they existed. Marcion's ideas had a significant following, but were quickly and heavily condemned by other church leaders and eventually suppressed[notes 2]. The Paulicians, a later sect from the same area, shared much of Marcion's theology. Since the Paulicians were likely the predecessors of the Bogomilists, and perhaps also the Waldensians and Cathars, Marcion may well have created many of European Christianity's medieval boogeymen. ↑ This is the only known mention of the Epistle to the Alexandrians, although the Epistle to the Laodiceans is arguably mentioned in the Epistle to the Colossians. ↑ In fact, the only reason why scholars have reconstructed his gospel is because it has so many quotations in works refuting it. ↑ See the Wikipedia article on Gospel of Marcion. This page was last modified on 29 January 2019, at 10:55.